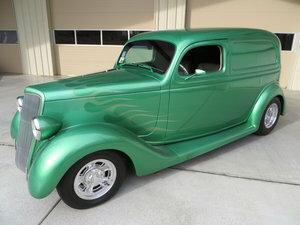 1933 Ford Sedan 4dr Hot rod., all Steel Body no rust, bottom of car great no rust, excellent body and running boards. Has chassis from Vision Rod and Customs chassis Inc. out of Cleveland ,Ga very nice and drives like it\'s on a rail. Has power dics brakes on front and drum on rear stops great. Has Pete and Jake dropped straight axle chrome frontend and aluminum billet backing plates all so has Unisteer Rack and Pinion that\'s is chrome that works great. New gas tank ,all new brake lines , battery mounted under car with quick diconect under passenger seat. Motor is 350 Chevy crate motor with small cam, new plugs and plug wires, new 600 Edelbrock carb, electric fan, ceramic coated headers, new exhaust, bumpers and grill very good condition, just installed led headlight and turn signal kit works nice all so has led brake lights, I think it has a Walker Radiator ,car runs cool even with the AC on in traffic, Turbo 350 Trans , lokar shifter, GM tilt Wheel, electric wipers, Custom front seats that are very comfortable and all new black leather interior that is excellent and front and rear seat belts, new glass and window felt . Vintage Air that is ice cold even in this Alabama 100 degree weather, New Steelie wheels and tires are about a year old, custom steering wheel, Nice stereo with 4 speakers, windshield will still roll out and cowl vent is still in working order. Top in great condition. Auto Meter white face gauges. New custom wiring harness I think its painless harness brand. Cowl lights that work and blinkers, chrome windshield frame. Has safety locks on all fours doors. Please Note The Following **Vehicle Location is at our clients home and Not In Cadillac, Michigan. **We do have a showroom with about 25 cars that is by appointment only **Please Call First and talk to one of our reps at 231-468-2809 EXT 1 ** FREE Consignment Visit Our Site Today Easy To List Your Vehicle and Get it Sold in Record Time.